428 Beacon is located on the NE corner of Beacon and Hereford, with 426 Beacon to the east, 448 Beacon to the west, across Hereford, and 12 Hereford (433 Beacon) to the south, across Beacon. 428 Beacon is a vacant lot at the northeast corner of Beacon and Hereford. It is the only lot in the residential portion of the Back Bay which has remained undeveloped since the land was filled. Since 1950, it has been under the same ownership as 426 Beacon and has served as a parking lot. The Boston and Roxbury Mill Corporation sold the 395 feet of land on the north side of Beacon between Gloucester and Hereford in three transactions: the eastern 32 feet 6 inches at the corner of Gloucester and Beacon to Harcourt Amory on April 20, 1881; the western 32 feet 6 inches at the corner of Hereford and Beacon to M. Woolsey Borland on December 7, 1882; and the 330 feet in between to George Higginson on January 14, 1884. Click here for an index to the deeds for 428 Beacon. Harcourt Amory sold his land in April of 1892, to Susan Mason (Lawrence) Loring, the wife of William Caleb Loring, and the Lorings built their home at 2 Gloucester (404 Beacon) on it. George Higginson subdivided his parcel and sold it to individual buyers, some of whom purchased the land to build houses for themselves and others who resold it to subsequent buyers. Between November of 1893 and September of 1896, Oliver Ames purchased the western 113 feet 6 inches of the land running east from Hereford, including the 32 foot 6 inch lot originally owned by M. Woolsey Borland and the western 81 feet of the land originally owned by George Higginson. Oliver Ames was treasurer of Oliver Ames & Sons, the pick and shovel business founded by his great-grandfather in North Easton, and an investor in real estate, railroads, and other businesses. He and his wife, Elise Alger (West) Ames, lived at 151 Commonwealth and then at 15 Commonwealth. They also maintained a home in North Easton. In March of 1896, Frank W. Crocker began purchasing Oliver Ames’s land on Beacon. On March 31, 1896, he purchased a 60 foot lot on the east, on August 9, 1897, he purchased a 21 foot 6 inch lot to the west of the first one, and on June 30, 1898, he purchased the remaining 32 foot lot at the corner of Beacon and Hereford. The June 30, 1898, deed included the land that would become 428 Beacon and 6 inches of the land where 426 Beacon later would be built. 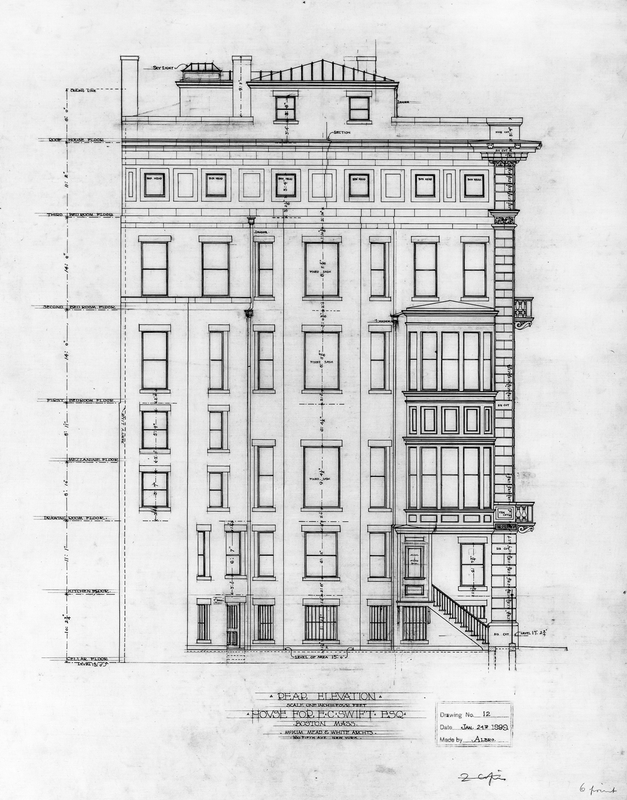 The deed included language, applicable to both 426 and 428 Beacon, limiting the depth of any building built on the lot to no more than 87 feet from front to back, not including bay windows. Frank Crocker was a clerk with the meat packing company, Swift Bros. & Co. (later known as Swift & Company), and was acting for Edwin Carlton Swift, who founded the company with his brother, Gustavus Franklin Swift. Edwin Swift and his wife, Florence Abbott (Bailey) Swift, lived at 21 Fairfield. 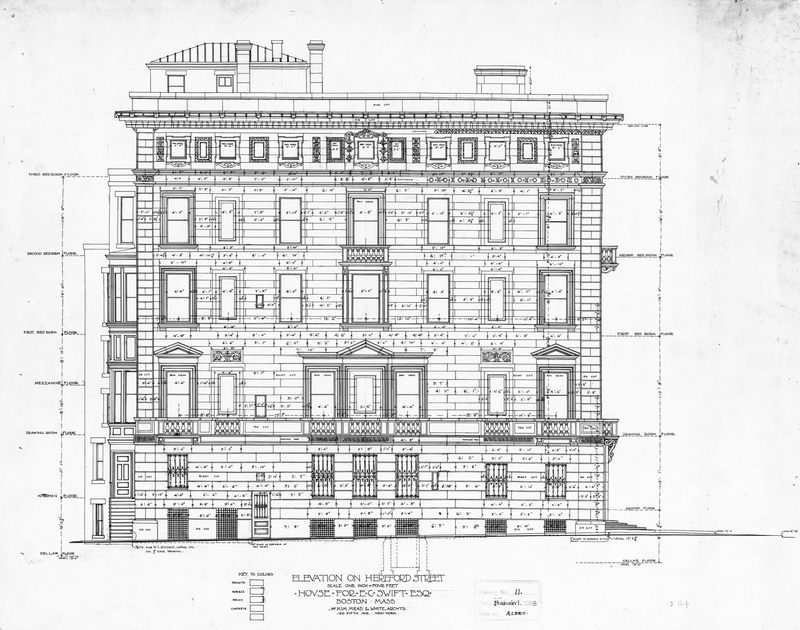 In 1899, the Swifts had drawings prepared by McKim, Mead, and White for a new Boston home at the corner of Beacon and Hereford. 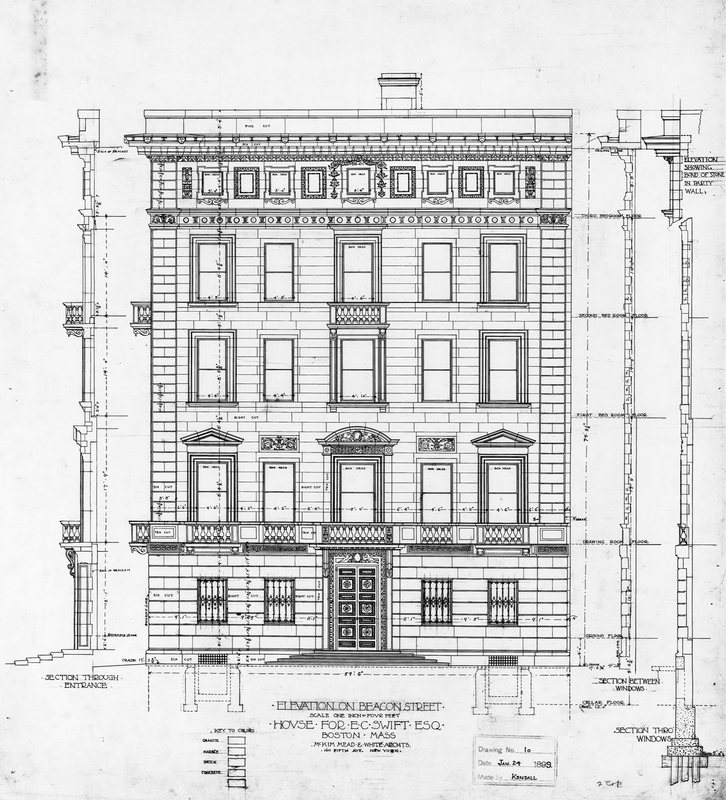 Plans for the house – including elevations, floor plans, section drawings, framing, electrical, and plumbing plans – are included in the McKim, Mead and White Architectural Records Collection (reference PR 042) at the New York Historical Society. The house was not built and, in about March of 1899, the Swifts purchased land in Prides Crossing where they subsequently built a home, Swiftmoore, designed by Arthur Little. Frank Crocker subsequently sold the land on Beacon. On May 2, 1899, he sold the western 28 feet to Frances (Converse) Leland, the wife of Lester Leland, who had 422 Beacon built as their home, and on May 31, 1904, he sold the 54 feet to the west of the Leland’s house to Ralph Blake Williams, and he and his sister, Ruth (Williams) Sears, the wife of Dr. George Gray Sears, had their homes built on it at 424–426 Beacon. The lot at the corner, with a 31 foot 6 inch frontage, remained vacant. On October 13, 1916, the lot was purchased from Mabel (Hunt) Slater by Marie (Griffin) Dennett, wife of Carl Pullen Dennett. They lived at 250 Beacon and then at 332 Beacon. 428 Beacon remained a vacant lot. On May 4, 1922, it was purchased from Marie Dennett by real estate dealer Thomas G. Washburn, and on February 7, 1924, it was acquired from him by George Richmond Fearing, Jr., an investment banker, and Charles Theodore Russell, a real estate dealer and trustee. George Fearing and Charles Russell appear to have planned to construct an apartment house on the lot. 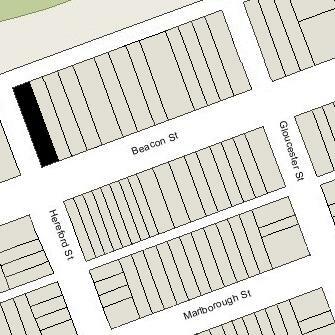 On September 8, 1925, they joined in an agreement with the owners of the houses at 420-426 Beacon specifying that no building more than one story high could be built north of a line 87 feet north of the building line established by City of Boston for Beacon Street (consistent with the deed restriction on 426-428 Beacon imposed by the June 30, 1898, deed from Oliver Ames). The agreement also specified that the main entrance of any apartment building constructed at 428 Beacon would be on Hereford Street and that there would be no more than one apartment per floor except on the first floor, where two there could be two apartments. Financing for the project was provided by first mortgage bonds sold by the American Bond & Mortgage Company. In July of 1927, the lot at 428 Beacon was acquired by Charles C. Moore, a vice president of the American Bond & Mortgage Company and stepson of its president, William J. Moore. The building was not built. In 1931, the officers of the American Bond & Mortgage Company – including William J. Moore and Charles C. Moore, along with William Moore’s sons, Harold A. Moore, treasurer, and Kenneth W. Moore, secretary – were indicted by grand juries in New York City and Boston for using the US mails to defraud in connection with other development projects for which they acted as financing agents. In September of 1931, the company declared bankruptcy. On December of 1933, the lot at 428 Beacon was transferred to Frank M. McKey, trustee in bankruptcy for the American Bond & Mortgage Company, and in November of 1934, the City of Boston foreclosed on its tax lien and took possession of the property. In December of 1945, the lot at 428 Beacon was purchased by Anna (Bravman) Davis, the wife of Edward I Davis, owner of the Fox and Hounds Club at 448 Beacon. The lot probably was used for parking for the Club. In April of 1950, the lot at 428 Beacon was acquired from Anna Davis by George Irwin Rohrbough and his wife, Martha Fraser (Waugh) Rohrbough. They lived in Cambridge. George Rohrbough was president of the Chandler School for Women, which had purchased 448 Beacon from Edward Davis’s 448 Beacon Street, Inc., in April of 1949. He and Chandler School subsequently acquired 420-422-424-426 Beacon. On August 10, 1971, the Massachusetts College of Optometry purchased 420-422-424-426 Beacon and the vacant lot at 428 Beacon from George Rohrbough and Rohrbough, Inc., successor to Chandler School. It used the lot at 428 Beacon for parking. In July of 1976, the College changed its name to the New England College of Optometry. On June 17, 2013, the College entered into an easement agreement with the Church of Scientology (owners of 448 Beacon) with respect to the use of Hereford Street between Beacon and Back Streets (that portion of Hereford being a private way). The agreement specified the exclusive right of the owners of 428 Beacon, to park vehicles on the eastern side of the street and the exclusive right of the owners of 448 Beacon to park vehicles on the western side of the street (in the late 19th Century, when it developed its land on the north side of Beacon, the Boston and Roxbury Mill Corporation retained the land between 428 Beacon and 448 Beacon as a privately owned extension of Hereford Street, 40 feet in width; the City of Boston did not designate the extension as a public street and when the Boston and Roxbury Mill Corporation ceased to exist, the property was subject to common law principles regarding abandoned property (codified in 1971 in the derelict fee statute) and the eastern half of the private way became the property of the owners 428 Beacon and the western half became the property of the owners of 448 Beacon). 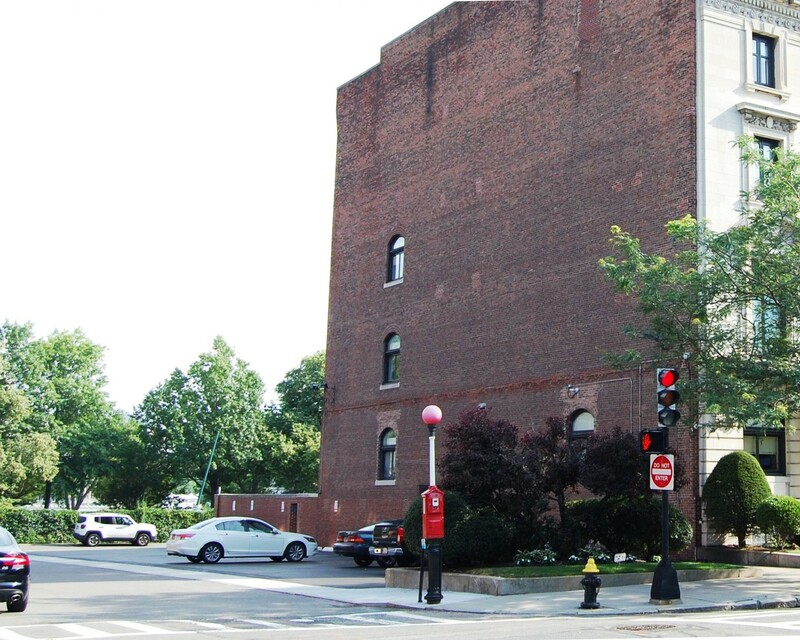 The lot at 428 Beacon remained the property of the New England College of Optometry in 2017.